At the 2016 Geneva Motor Show, Bentley took the curtains of its all three Mulsannes. All three models, the EWB, Standard Mulsanne and the Bentley Mulsanne Speed 2017 are adorned with traits to satisfy their precious buyers. Talking about the latter, company gave this luxurious model some extra oomph to rule your hearts. 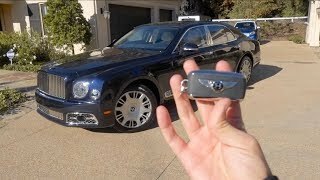 Let us have a look at the review of Bentley Mulsanne Speed 2017 to know in detail about it. The interior of Bentley Mulsanne Speed 2017 is almost the carry forward. Starting from the elegant dashboard to the four-spoke steering wheel and the center console, things are the same. Customers will notice the same dual-tone effect over the door panels; however you do have the option to have one out of the 13 hand-selected wood veneers. It isn’t like everything here is the something from past. For this particular model, buyers will get the Mulliner Driving Specification package as standard. The package brings knurled gear shifter with alloy sports pedals and an option to replace wood inserts over the door panels with carbon-fiber. But wait!! This isn’t the only change. The major difference comes with the diamond-quilt leather that covers the seats and some portion of door panels. The leather seats get contrast leather stitching matching the exterior color. Apart from the comfort and looks the new rebellion gets an updated infotainment system, getting featured through an eight-inch infotainment getting accompanied by a 60-gigabyte hard drive that makes its impeccable presence over the elegant dashboard. Last but not the least, the rear passengers get a set of 10.2 inch Android tablets. Thus rounding up the interior details of Bentley Mulsanne Speed 2017 I call it an unmatched amalgamation of comfort, class and technology. 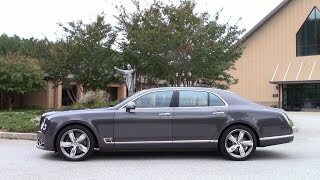 The exterior of Bentley Mulsanne Speed 2017 is a carry forward of the the standard Mulsanne. You can notice the wide grille sitting aggressively amidst the set of headlights. Beneath the setup there is a ‘B’ shaped air vent with a chrome strip that further marks its presence till the rear wheels. A closer look will bring minute changes like the B-shaped vents over the sides and the black outlining that makes it look more aggressive. The lights at the front and rear get the same tint contrast further adding to the menacing exterior. 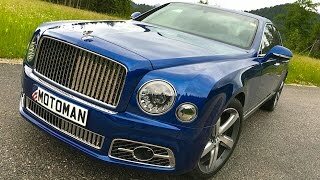 Thus rounding up the exterior of Bentley Mulsanne Speed 2017 looks sportive and aggressive with the massive 21-inch rollers. 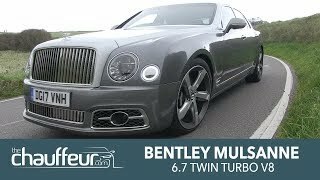 Beneath the hood of Bentley Mulsanne Speed 2017 is the same 6.75 liter twin-turbo V8 engine but with more power. The unit now cranks total output of 530 hp and peak torque of 1100 nm mating to updated ZF eight-speed transmission with a specially designed ‘S’ mode feature. With this the model can sprint from 0-62 mph 4.9 seconds while the top speed of Bentley Mulsanne Speed 2017 touches the mark of 190 mph.